Aerial test site on the moors above Sheffield, at an altitude of around 345m (1140ft). Aerial testing, why it all started……..
Over the years we have tested dozens different models of TV aerial on Belmont (A / Wideband), Waltham (CD / Wideband), Bilsdale (A / K), Crosspool/Sheffield (A / K), Emley Moor (B), Stocksbridge (CD) Oughtibridge/Wharncliffe (CD). The results are interesting to put it mildly, we rely on our own data now and more or less ignore manufacturers figures. This is particularly the case where they only give a (peak) gain reading. Even if the latter is accurate, this figure can be misleading, especially with wideband aerials. What you really want is the gain graph, but many manufacturers won`t release this information, arrogant gits. Also see Aerial Polar Diagrams. Differences in the test results of one dBμV on any individual frequency should be disregarded, manufacturing tolerances or a truck going over a hill somewhere between the test site and the TX could easily account for those ! Furthermore the response of any aerial is not linear, its gain curve will have bumps and dips in it. That said, a 1dB difference across the whole band is significant, and an increase (or decrease) of two or three dB is very significant. It should be remembered that 3dB is a 40% higher signal level, and such an increase at the aerial (as opposed to through an amplifier) is very difficult to achieve. Obviously if you live in a decent reception area these amounts of signal variation are not important, but if that`s the case, you should just use a Log Periodic anyway ! The above table is a summary of the results, for the full results click here. It should be borne in mind that gain is not everything, which is why Logs are still one of the best aerials despite being having relatively low gain figures. Impulse noise rejection, directivity, out of band rejection, cross polar rejection and front to back ratio and can all have significant effects on the quality of the received signal. Having said that, gain is a function of the others (apart from impulse noise rejection) as it demonstrates that the antenna is performing efficiently. Indeed gain must be a function of the others. Why must ? Well an aerial is a passive device, the only way it can increase its gain in a particular direction is at the "expense" of gain in the other directions. As an aerial`s gain increases, its acceptance angle (and its cross polar rejection come to that) decrease. They must do, there is no other way for the aerial to increase its gain. 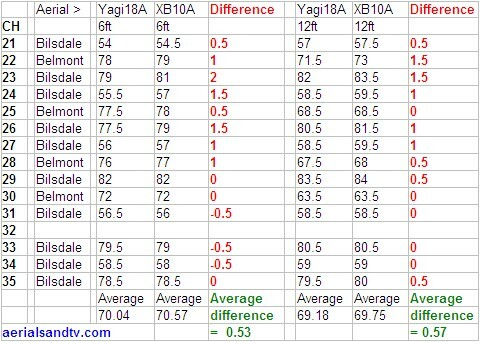 This table compares six Yagi 18s of the same model, but of all five groups plus Wideband. 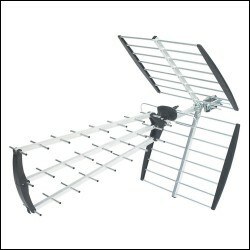 Note, we don`t actually sell the Yagi 18 wideband (because the DY14WB outperformed it by a significant margin) but the gain plot is included because it directly compares aerials of the same model. Interestingly these grouped Yagi 18s performed just as well as grouped XB10s, and since the Yagi 18s are cheaper, have lower wind loading and are (arguably) more robust in construction, we do stock those. The test methodology, and points to bear in mind when interpreting the results, are explained above. The figures are obviously for this particular model of antenna. Other models varied in performance and this was particularly the case for gain outside the designed for band. As an example, the point above which significant gain fall off occurred, for A group aerials this varied from CH40 to CH42, and for B groups from CH56 to CH59. For gain within band, other tested 18 element A groups (which we don`t stock) gave around 3dB (av) more than a DM Log, the other B groups gave 4 to 4.5dB and other C/D groups gave 4 to 4.8dB. We tested the aerials against each other at the same time, in the same location, and in actual reception conditions. We have also retested the same antennas and find the signal reception can vary for no apparent reason (possibly the temperature or humidity ? ) so our figures are based on more than one test and our own everyday experience. 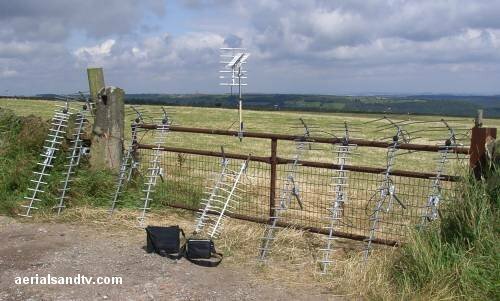 In summer 2007 I decided to institute a major new test programme and identified a site on the hills above Sheffield which would enable me to do this as it has “line of sight” off four main transmitters and two repeaters. Between them they cover virtually all the TV band frequencies. Some of the most significant data concerned the response of grouped antennas above and below the designed for frequency band, this is particularly relevant for some transmissions which aren`t within the transmitter`s original (analogue) group. 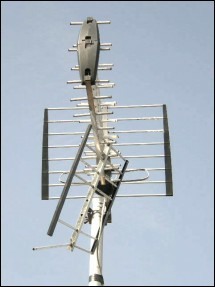 As an example it proves that a B group aerial (certainly the ones we sell ! ) will work perfectly well on CH 55, and not too bad on 56 either [see the relevant graph]. Crappy Contract aerials might not though ! At least two readings were taken - sometimes many more - on every frequency for every aerial (including many not published on this site), so some idea of the work involved can be imagined. I reckon I took around 8,000 individual readings, and that was just the 2007 tests ! Whilst it was very interesting to start with, it could became a hell of a grind ! But how accurate are these tests ? Well, I can only say that when I`ve retested aerials, the results, when comparing similar types of aerial, were pretty much the same, as indeed they are when I`ve tested the same aerials on the roof of our shop, a completely different location (and height off the ground). Furthermore, the results are actually more or less what you`d expect. Whilst retesting a Yagi18A and a XB10A I decided to take a 2x2 bracket and a 6ft pole* along so I could mount the test aerial on the latter and then slide it from 6ft to 12ft, and back again. I tested them against each other at 6ft, and again at 12ft, then, repeated the process to increase the accuracy. It`s very important to understand the difference between the received signal at the two heights, and the difference in the received signal between the two aerials at those heights. The former obviously did vary, and by quite a bit, but the latter hardly varied at all, even less than I thought it might. On reflection this isn`t that surprising because testing similar aerials against each other at the same time, is the most accurate way to test comparative performance. Note that the signal level on Belmont actually dropped as we raised the aerial, though it increased on Bilsdale, yet the difference in gain between the two aerials was still the same ! * We wouldn`t normally advise using a 6ft x 1" pole, or only one 2x2 bracket come to that, but this was only a temporary set up. It should be noted that as antennas leave their designed for band their performance can become erratic and the further out of band you go the more pronounced this becomes. This can give spurious readings, particularly in a spot where multiple TXs can be received, because the aerials directivity can become very poor and inconsistent. This is the main reason why we have not published some readings (e.g. C/D off an A group) as they are meaningless. In order to make the results comparable all readings are in dBuV and are all relative to a DM Log Periodic aerial. 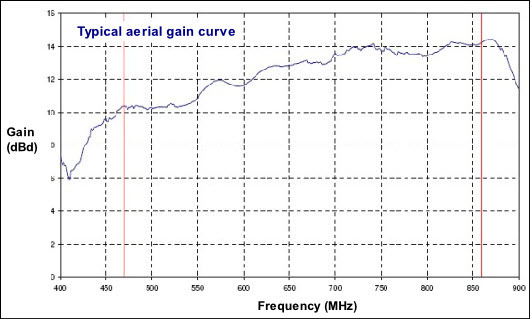 The latter has a pretty flat gain curve and thus is an ideal control antenna. Quite apart from anything else, wherever possible (i.e. in reasonable signal areas), Logs should be used as a matter of course, so the table(s) will show how much gain you have to make your decision on antenna choice. Note how the Log performs pretty well (in terms of gain) against small/medium wideband Yagis at the bottom of the band(s) but falls behind as the frequency rises. For those who are interested I reckon that, conservatively speaking, the gain of a DM log would be about 6 dB at the bottom of the band, then rising by about one dB in the middle, before dropping a little at the top end. These are the figures I used when calculating the absolute gain for the graphs. The absolute gain figures are conservative estimates, though they are accurate relative to each other. Remember that all aerial test readings are approximate anyway, as far as I`m aware no lab will even guarantee accuracy better than +/- 0.5dB, and relative to each other these test results aren`t going to be much behind that. Such are the signals available at 1140ft that even the DM Log gave/gives the signals shown in the table below. Bear in mind that the Yagi18s were giving up to 7dBμV more than that and the XB16s up to 9dBμV more, that`s NINE ! Just to put it in perspective, one should be aiming for 60dBμV (on digital), more than that and cross modulation interference can result. How accurate are these tests ? Incidentally I`ve been on a trip round Drax and West Burton, they were mind blowing ! Now, I knew that putting a balun in a DAB dipole cuts down the FM considerably, in fact that was the start of all my aerial testing back in April 2007. To be frank, compared to what I know now, I didn`t really know that much about aerials. I`d sold a DAB dipole to a chap who wanted DAB and FM. I assumed that because the frequencies were fairly similar it`d work for both. But the chap brought the aerial back saying the FM was rubbish (to be fair he wasn`t in the strongest signal area) and I can remember being stood in the shop thinking how can that be ? So, whilst he waited, I grabbed our spectrum analyser, connected it up to the DAB dipole, went up on our flat roof (in the pouring rain……) and “waved it about a bit” whilst checking the spectrum. Sure enough, not much FM, though our flat roof is fairly low down so I wasn`t 100% convinced either way. I swapped the the guy`s DAB dipole for a FM Half Wave and asked him to try that. He never came back so I assume it was all OK. But I, on the other hand, was not OK. My curiosity was positively burning, which led to all our FM/DAB tests (then TV aerial tests, then pole tests etc etc ! ). Anyway, the upshot is I learnt it was the balun in the DAB aerial which was filtering out much of the FM signal. To continue the story, years later, one of the companies which manufactures aerials for us accidentally put a load of DAB baluns in FM aerials, straight away I told them that would be a problem, and did some tests to prove it. * This last test came about in April 2014 when the manufacturer of the Yagi18A announced they were no longer manufacturing A group baluns, they`d be fitting wideband baluns instead. I was concerned that might result in a drop off in gain so went and tested it. I was relieved to find that there was no significant difference. 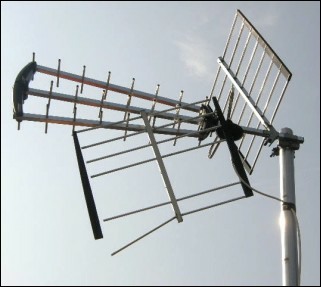 Tri boom aerials were popularised by Televes (the DAT45 and 75) but more recently other companies have started producing them. I`ve never been that keen on Tribooms, I have generally found their gain figures to be lower than expected, in fact anyone who knows about aerials knows Tri Booms are not made to work, they`re made to sell. In addition Tri Booms have a high windloading and, if end mounted (and most are), they put a high twisting force on the pole. I actually tested a SAC MUX Magician, but there are other models which look very similar, e.g. the Labgear LAB450W / 450T and the Triax 343. Some are (or were) manufactured by Iskra. I tested the original wideband version which has been superseded in some cases by a T group with supposed 4G rejection. In my experience, this is never as effective as using a decent filter and furthermore usually lowers the gain at the top end of the aerial, see graphic below. 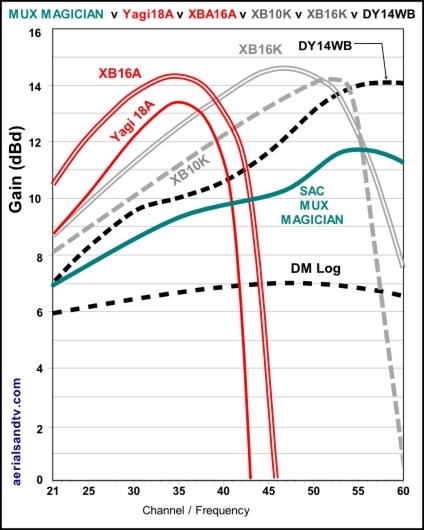 Against the SAC MUX Magician I compared a DY14WB, an XB10K, an XB16K, a Yagi 18A and an XB16A. Technically the DY14WB is the only directly comparable aerial (being the same group) but after the 700MHz clearance the two K groups will effectively be widebands, particularly as MUXES 7 & 8 are due to be turned off between 2020 and 2022. The inclusion of the two A group aerials is to highlight the low gain of widebands in the A group. Remember Crystal Palace and Rowridge (amongst others) are A groups (excl the aforementioned MUXES 7 and 8) and after the 700MHz clearance quite a few other transmitters will also be A groups including Winter Hill and Waltham. Anyway the results are below in summary form (full results are here). 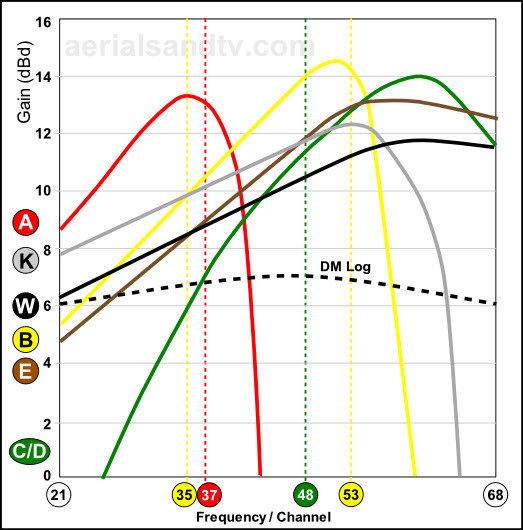 As is usual all aerials are compared to a DM Log aerial, which has gain of between 6 and 7dBd, thus, for example, a Yagi 18A has an approximate average gain (in the A group) of about 11.4dBd, the MUX Magician would be about 3.4dB lower (at around 8.0dBd). NOTE : we are quoting dBd not the (disingenuous ? ) dBi. Interestingly an SLX / Philex “Bacofoil aerial” actually gives slightly more gain than this supposed “ultra high gain” tri boom aerial…..
Having said all the above, 90% of RF reception is down to the signal strength at the site. The fact the MUX MAGICIAN is in last place in the “gain league” would not matter at most sites, though one has to ask the question why put up with much greater wind loading if you`re not actually getting more gain ! MUX Magician “economy” Tri Boom aerial on test. Of course it`s not just about gain, it`s also about build quality and wind loading, the latter putting extra stress on your poles and brackets etc. So long as one`s installation hardware is sufficiently robust then high windloading can be overcome but, all things being equal, it`s better to have less wind loading, particularly if the aerial is mounted on a long pole ! Tri booms, unfortunately have a particularly high wind load, I estimate about 150N (at 80mph), that`s about twice that of a Yagi18 and 25N more than the biggest aerial we sell, the XB16A ! Furthermore this type of Tri Boom are end mounted which puts a large twisting force on the pole, thus the use of saddles is recommended especially in exposed locations. So, we have mediocre gain (particularly with the number of elements used), high wind loading, end mounted (handy for some installs I grant), and, dependent on model, build quality problems. To be frank, I think all Tri Booms are a bit of a sales gimmick anyway, and these more than most.